The Arathi Highlands warfront experience is an interesting one. This week the Horde get to the do the true warfront experience, while us Alliance just get access to the newly revamped Arathi zone. We have a few weekly quests and a zone full of ‘rare’ mobs (which I call ‘star mobs’ since they’re a star on the minimap) and one world boss. The RTS-inspired warfront experience will come next week for us. So for me, there’s not much to tell other than my luck is abysmal and I didn’t get any from the world boss there (or the first world boss WQ to spawn in Kul Tiras either). My new guild I found really made my evening. 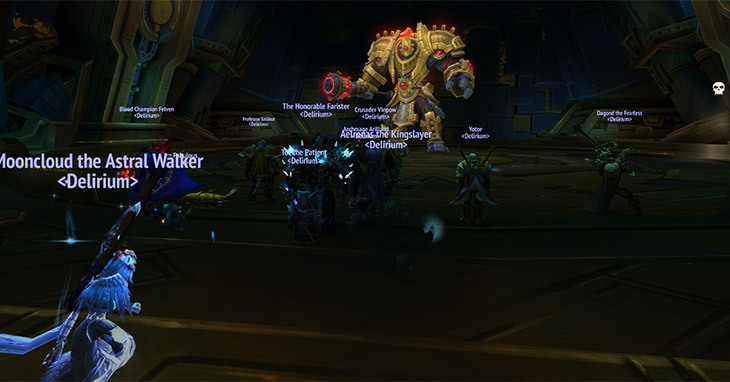 We all went into Uldir (about 20 of us) and 2-shot each of the bosses we attempted. What an awesome evening. This guild raids twice a week with a 2 hour limit to each night. This is exactly my style of raiding. It’s casual enough yet still plays enough to try. Our goal is to just see the content. They’re a good group of people who have played with each other for several years, so while I feel like I’m still trying to find my place among them, I can see a future here if I want one. The boss mechanics were really cool. I particularly enjoyed MOTHER’s mechanics of having to run through these barriers one group at a time. Overall I think I will enjoy the Uldir raiding experience. And I actually got a loot drop! I’ve only done one Mythic+ so far, and unfortunately it was tainted by the group inviting a tank who wasn’t really a tank — he was a DPS spec in disguise. I can’t quite figure out how it happened, but he was woefully under-geared for tanking, and didn’t know how to play. This resulted in our group having 64 deaths, not leveling the keystone, and taking almost TWO HOURS to complete the dungeon. Most of us were guildies, so we were able to commiserate in guild chat. We agreed it was the worst experience we’ve had in the expansion so far. Lesson learned! Seriously vet your group members. Note: That doesn’t mean impose ridiculous restrictions, just make sure they’re not faking their spec in order to get invited.